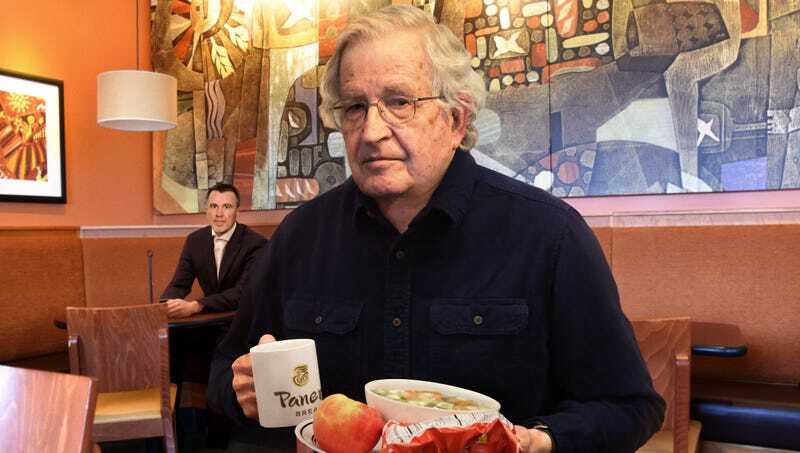 TUCSON, AZ—Sighing as he settled into a corner table in the fast-casual eatery, FBI agent Thomas Vaughn, who is still tasked by the intelligence agency with following around left-wing writer Noam Chomsky, was reportedly preparing Wednesday for another day in a local Panera Bread. “I know we’ve been trailing this guy for decades to find out whether he’s trying to subvert the U.S. government, but I’m pretty sure he’s just an old man ordering a half sandwich and soup—again,” said the frustrated agent, adding that he was tired of trying to look busy for multiple hours a day in the Panera while spying on the 89-year-old linguist and activist slowly eating lunch while reading a James Patterson novel or doing Sudokus. “Then I’ll have to follow him to the dry cleaners and the pet store, but if Chomsky buying cat food is actually a signal to left-wing cells as part of some radical plot to overthrow capitalism, I think I would’ve figured that out by now. And tonight, I guess I’ll file another report that I sat in the van for five hours and listened through the devices we secretly installed in his house to hear that he and his wife are planning to go to Taos for the weekend and also want to replace the deck. Seems like a good use of the FBI’s time and resources.” At press time, Vaughn was calling FBI headquarters with a tip that Chomsky may be helping to fund a working-class uprising after fishing through a Panera trash can and finding a receipt showing he left a 25 percent tip.